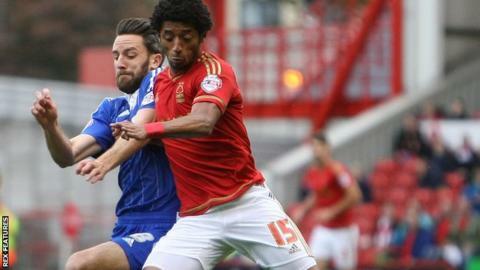 Nottingham Forest's early onslaught earned a fourth successive home league win, despite a late MK Dons revival. The hosts took the lead after just two minutes when Nelson Oliveira fired a left-footed shot past David Martin. Ryan Mendes then stabbed in at the second attempt from a Daniel Pinillos cross to double Forest's lead. The Dons rallied but Dorus de Vries saved Nicky Maynard's penalty before Josh Murphy's first-time strike set up a nervous finish. MK Dons went into the game with just one away victory all season and were soon facing an uphill battle when Oliveira rifled in his fifth goal of the season from Mendes' through-ball. De Vries was forced into a save by Rob Hall's free-kick but it was soon 2-0, with Mendes getting in front of Dean Lewington to finish while on the ground. Oliveira then rolled a shot wide after being put through one-on-one with Martin by Mendes' header. As the Dons responded, De Vries made a save with his legs from Dean Bowditch's shot before Oliveira struck the post with a dipping shot from 30 yards. The introduction of Murphy from the bench gave the visitors further impetus and he won a penalty when Eric Lichaj dragged him down, but De Vries guessed correctly to keep out Maynard's spot-kick. Murphy played a one-two with Lewington and swept into the bottom corner to finally reduce the deficit, but Forest held on to make it five Championship games unbeaten. The win moves Forest up to 13th, while MK Dons drop to 21st, just a point above the relegation zone. "We had to make sure we defended properly in the last 10 or 15 minutes and credit to the lads for that. "MK Dons had nothing to lose and they threw on a few subs and fired the ball into the box. "But what really pleased me was the start to the game we made. We got two goals, could have got three in the first 20 minutes had Nelson put away another chance. "Nelson has that cutting edge and he is only going to get better for us." "I thought we were the best team, beyond our mistakes in the first half. "I thought we dominated territorially. We created chances. The difference is when you have the kind of quality players that Forest do playing against you. "But we have pushed them hard by playing good passing football, not by lumping the ball into the box or kicking them. "I am proud of the way we came to Forest and played. I did think we were going to get something out of the game. Our substitutions made us stronger." Match ends, Nottingham Forest 2, MK Dons 1. Second Half ends, Nottingham Forest 2, MK Dons 1. Sam Gallagher (MK Dons) wins a free kick on the left wing. Foul by Liam Trotter (Nottingham Forest). Delay in match Samir Carruthers (MK Dons) because of an injury. Delay in match Michael Mancienne (Nottingham Forest) because of an injury. Attempt blocked. Kyle McFadzean (MK Dons) left footed shot from outside the box is blocked. Assisted by Josh Murphy. Corner, MK Dons. Conceded by Jamie Ward. Substitution, Nottingham Forest. Liam Trotter replaces Nélson Oliveira. Goal! Nottingham Forest 2, MK Dons 1. Josh Murphy (MK Dons) right footed shot from the left side of the box to the bottom right corner. Assisted by Dean Lewington. Substitution, Nottingham Forest. Jamie Ward replaces Ryan Mendes. Corner, MK Dons. Conceded by Eric Lichaj. Penalty saved! Nicky Maynard (MK Dons) fails to capitalise on this great opportunity, right footed shot saved in the bottom left corner. Penalty MK Dons. Josh Murphy draws a foul in the penalty area. Penalty conceded by Eric Lichaj (Nottingham Forest) after a foul in the penalty area. Substitution, MK Dons. Sam Gallagher replaces Dean Bowditch. Substitution, MK Dons. Carl Baker replaces Jordan Spence. Attempt missed. Dean Bowditch (MK Dons) left footed shot from the centre of the box misses to the left. Offside, Nottingham Forest. Henri Lansbury tries a through ball, but Ryan Mendes is caught offside. Chris O'Grady (Nottingham Forest) wins a free kick in the defensive half. Substitution, Nottingham Forest. Jack Hobbs replaces Daniel Pinillos because of an injury. Delay in match Daniel Pinillos (Nottingham Forest) because of an injury. Attempt saved. Nélson Oliveira (Nottingham Forest) right footed shot from outside the box is saved in the bottom left corner. Assisted by Eric Lichaj. Attempt missed. Robert Hall (MK Dons) left footed shot from the left side of the box is too high. Substitution, MK Dons. Josh Murphy replaces Ben Reeves. Corner, Nottingham Forest. Conceded by David Martin. Attempt saved. Henri Lansbury (Nottingham Forest) right footed shot from outside the box is saved in the bottom right corner. Foul by Kyle McFadzean (MK Dons). Ben Osborn (Nottingham Forest) wins a free kick in the attacking half. Hand ball by Chris O'Grady (Nottingham Forest). Attempt saved. Ben Osborn (Nottingham Forest) right footed shot from the left side of the box is saved in the top centre of the goal. Assisted by David Vaughan.